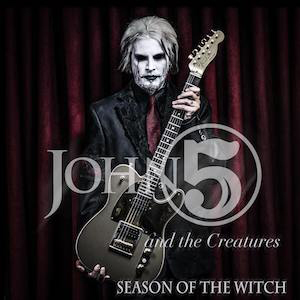 Season Of The Witch, set to be released on March 3rd, is the eighth full-length solo record from guitar-virtuoso JOHN 5. Although this album is yet to be made available, several tracks have already been released with accompanying music videos over the last year, so much of the material may already sound familiar. The record is as diverse as JOHN 5’s entire body of work. Most of us know him as “that guy in ROB ZOMBIE” or “MARILYN MANSON's former guitarist”, but John Lowery has been heavily involved in the scene for decades now and has worked, written, recorded and/or toured alongside the likes of K.D. Lang, Rob Halford, David Lee Roth, SCORPIONS and LYNYRD SKYNYRD, just to name a few. Whether he was drawing influences from the his days as a kid watching Hee Haw for the song “Hell Haw” or the menacing, ZOMBIE-esque, title track “Seasons Of The Witch”, JOHN 5 and his band, THE CREATURES - rounded out by bassist Ian Ross and drummer Rodger Carter, manage to touch on the genres of metal, Spanish flamenco, country-western, blue grass and jazz fusion in just about any combination imaginable. Highlights include the up-tempo “Black Grass Plague”, which incorporates heavy riffs with a little western seasoning; “Making Monsters” is a rocking tune which happened to be one of the previously-released music videos and featured a claymation John 5 playing the tune alongside several of the Universal monsters; and my personal favorite, “Here’s To The Crazy Ones” is a very groove-oriented, jazz-fusion-laced, smorgasbord of a song that features a great hook in the chorus. “Here’s To The Crazy Ones” was also released with a music video featuring an ode to the old Planet Of The Apes films. Season Of The Witch truly has something for everyone. It is extremely palatable and the listener will easily learn to appreciate just how well-rounded and skilled not only John 5 is, but also how talented Ian and Rodger – “The Creatures” are. Look for it everywhere March 3rd and also checkout JOHN 5 & THE CREATURES on the “Season of the Witch” Tour this Spring.